Twister Balloons There are 6 products. 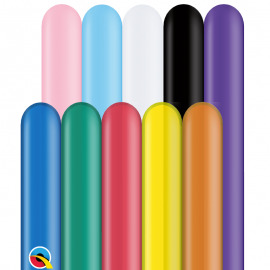 160Q Entertainer Balloons - Bag of 100 Traditional ColorsSize: 1" x 60"Colors included: Pink, Pale Blue, White, Onyx Black, Quartz Purple, Sapphire Blue, Emerald Green, Ruby Red, Citrine Yellow and Mandarin Orange. 260Q Entertainer Balloons - Bag of 100 Traditional ColorsSize: 2" x 60" when inflatedColors included: Pink, Pale Blue, White, Onyx Black, Quartz Purple, Sapphire Blue, Emerald Green, Ruby Red, Citrine Yellow and Mandarin Orange. 350Q Entertainer Balloons - Bag of 100 Traditional ColorsSize: 3" x 50" when inflatedColors included: Pink, Pale Blue, White, Onyx Black, Quartz Purple, Sapphire Blue, Emerald Green, Ruby Red, Citrine Yellow and Mandarin Orange. 160Q Entertainer Balloons - Bag of 100 Character ColorsSize: 1" x 60" when inflatedColors included: White, Blush, Mocha Brown, Chocolate Brown, Onyx Black and Gray. 260Q Entertainer Balloons - Bag of 100 Character ColorsSize: 2" x 60" when inflatedColors included: White, Blush, Mocha Brown, Chocolate Brown, Onyx Black and Gray. 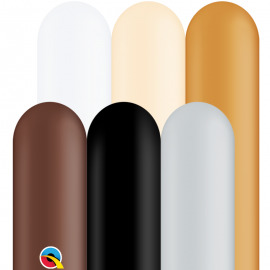 350 Q Entertainer Balloons - Bag of 100 Character ColorsSize: 3" x 50" when inflatedColors included: White, Blush, Mocha Brown, Chocolate Brown, Onyx Black and Gray.